New York, November 23rd 2010 - Acer enters the tablet arena with a very clear objective in mind: complete its range of products in support of its goal to simplify content consumption – a strategy which began with the development of Acer's multimedia sharing system, Clear.fi. Acer's strategy is based on the concept of sharing multimedia content and enjoying it across any device, and Tablets are ideal devices for this purpose. Mobility, which has always been part of Acer's DNA, finds a new form of expression in the range of tablets on offer, which feature various display sizes and models designed to fit different kinds of usage scenarios. Weight and display size have a huge impact on the user experience. While devices with bigger screens are used to share and enjoy content, smaller devices are often used to create content - taking photos, recording videos or sending messages. Sleek, smart and full of innovative features, the 10.1" full capacitive touch screen tablet with Wi-Fi and 3G connectivity ensures an optimal on-screen experience from every angle. Aluminum casing provides a cool look and feel, while its high gloss finish decorated with engraved patterns creates a subtle sophistication. And despite being just 13.3mm thick, it's powerful enough to guarantee fun and productivity whether you need it . Don't be fooled by its ultra-compact size: the 7" tablet is fully featured and takes your mobile experience to the next level. On the 7" (1280x800) 16:10 aspect ratio full touch screen, you can enjoy games, photos, videos while keeping up with your emails or your favourite social networks. Video chat or record a video with the front-facing HD camera. With HDMI support, hooking it up for a big screen video experience is easyier than ever! 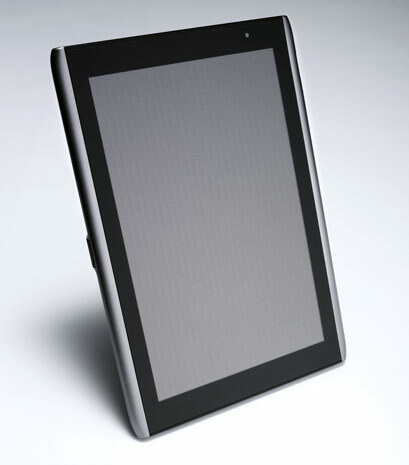 The 7" inch tablet will feature a dual core processor with Adobe Flash Player 10.1 support for the fastest HD Web experience and multimedia playback anywhere. And for a truly amazing sound experience, it will come with Dolby Mobile Technology. Wi-Fi and 3G connectivity allow fast and easy connection to available networks, while DLNA support makes sharing your multimedia on other devices easier than ever.